Our company trading name is Dean Organs (we use Shop 4 Music Boxes, The Music Box Shop, Dean Organ Builders & Music Shop Direct as our trade mark shop names) & our VAT number is 736 4158 26. Should you not receive these email confirmations, please contact us to check on your order status. Tel: 01275 834474. Many items featured are handmade or finished so it is expected that colours and designs may change slightly from the pictures and details shown. Some items sold from our Catalogue & Website are manufactured outside of our own workshops, in the Far East as well as other parts of Europe. Due to Royal Mail & Courier terms, it is the customers' responsibility to provide us with the full and correct delivery address including: - 1. The house name or number.2. The street or road name.3. The village or town. 4. The county. 5. The correct post code.6. The country. When we provide a quotation or order for a specific mechanical organ from our range, it will be referred to as 20, 30, 35, 36, 48, 52, 65, 87, 89, 98, 112 keyless or keyed or similar description. This description will be deemed to mean our standard model as currently produced for the particular given size. The specification of that particular instrument will be our standard production model at the date of order or quotation. That model may alter depending on our design parameters at that time and not necessarily be identical to a previous build as we constantly improve and refine design. Therefore, should you require a specific break down of the current model you should request this in writing from us. Should the specific instrument ordered or quoted include a decorative facade, unless otherwise stated this will be the standard facade of back board and carvings, painted in basic style. It will not include any specific painted scenes or carved mechanical figures, these will always be quoted separately at extra cost. The percussion fitted to an instrument will be the standard percussion provided for that model specification at the date of build. Once an order is placed it is deemed that you accept our standard current model of the particular instrument ordered as is being built at that date. When we provide a quotation or an order is placed for a custom made specific mechanical organ part (i.e. not a stock part), it will be referred to as "primary chest, wind chest, drum action, keyframe, bellows or another similar description".This description will be deemed to mean our standard model part, specification, size and design as currently produced for the particular part described. The specification and physical size of that particular part will be our standard production model at the date of order or quotation. That model may alter depending on our design parameters at that time and not necessarily be identical to a previous part as we constantly improve and refine design.Therefore, any mechanical organ part ordered and being custom manufactured will be deemed to be ordered to our standard specification as stated above, should you require any part not to our standard manufacturing specification it is the purchasers responsibility at the time of quotation to provide written sizes and drawings for the part, if no drawings or size specification are received in writing at that time, then it is deemed that you accept our standard current model of the particular mechanical organ part, as is being produced at that date.By placing your order for a particular part with us it is deemed that you accept the above and understand that as the part is custom made specifically to your order that we are unable to offer refunds or take back such organ parts. Please note the above is only applicable to custom made up parts and does not apply to standard organ parts as listed at our online sales site HERE where normal distance selling laws apply. All musicians play and interpret music in their own way, this is also applicable to the various music arrangers that work for us, or supply us with musical arrangements and notation for mechanical organs, they interpret the musical work and produce a version in their own style and artistic way. Therefore by placing an order with us for perforated card board music or paper roll music, the customer is deemed to accept our version/ notation /arrangement, of the particular tune ordered. In placing your order you accept and understand that the tune we supply in music book or paper roll form, may vary from the original composer's composition or any particular arrangement or version of that tune you may have heard previously. By placing your order you are deemed to accept our music book, paper roll or midi version and accept any artistic and musical changes we may have applied to our version of the work. By placing your order for a particular tune in music book or paper roll form with us it is deemed that you accept that music books and paper rolls are not returnable just because you do not like our particular musical interpretation, version or arrangement. We do not operate a sale or return policy as all of our music is custom made and cut specifically to your order, we are unable to offer refunds or take back music books or paper rolls. 02.3 (A) Please note all music orders for midi format music, must be paid for prior to despatch, we do not operate or offer credit accounts on this format of organ music. All blank cardboard for the manufacture of music books is sold subject to Proforma. As the cardboard is cut down specifically to your size it will not be cut until your payment is received and cleared at our bank. Once the cardboard is cut it is not returnable because it will have been specifically cut down to match your order and size. Once the card has been cut to size we cannot accept cancellation of that order or make a refund. Therefore by placing an order with us for blank perforated card board, the customer is deemed to accept our terms of supply on this product. We do not operate a sale or return policy on blank cardboard book as it is custom made and cut specifically to your order, we are unable to offer refunds or take blank perforated card board back. Dean Organ Builders warrants all products as per our standard terms and conditions which are viewable at our website. This warrants all mechanical organs to be free of defects in material and workmanship for twelve months from the date of collection. Not covered under this warranty is normal wear and tear, neglect or misuse of the organ and operation in an application or manner not approved by Dean Organ Builders, and alterations not performed by Dean Organ Builders. Any items supplied within the mechanical organ that are manufactured by others shall be warranted under the respective manufacturers' policy. Dean Organ Builders will provide any support required ensuring that warranty service by others is handled in a prompt and professional manner. Dean Organ Builders warranty is limited to the repair or replacement of the items supplied by Dean Organ Builders. At no time will Dean Organ Builders be liable for any of the costs to the buyer for labour, transportation or down-time resulting from defective organs furnished by Dean Organ Builders or our suppliers. To comply with our warranty the complete mechanical organ must be returned to Dean Organ Builders at the buyer's expense. Disassembly of the organ will invalidate the warranty. The warranty is also subject to a 6 month commissioning service which is chargeable to the buyer. This service must be carried out at 6 months from the delivery date. Disclaimer of liability. Dean Organ Builders shall not be liable to the buyer in respect of any claim, demand or action, irrespective of the nature of the cause of the claim, demand or action alleging any loss, injury or damages, direct or indirect which may result from the use or possession of the mechanical organ, or for any loss of profit, revenue, contacts or savings, or any other direct, indirect incidental, special or consequential damages arising out of your use of or inability to use the mechanical organ, or the breach of these terms or conditions whether in an action in contract or based on a warranty even if Dean Organs have been advised of the possibility of such damages. Depending on the size of item/type of goods, we will inform you of the best way to return them by either royal mail post or courier. Once we have informed you of the way to return the goods please re-pack & send (with the original packaging and your receipt) them back to us. Please ensure you obtain a receipt and proof of posting from Royal Mail or the Courier. Due to Royal Mail & Courier terms we cannot list goods as being lost in transit until after 14 working days have passed from date of posting. If the goods have still not arrived by then, we will either send out a replacement at no extra cost, or issue a full refund. Once an order is fulfilled by Dean Organ Builders and the customer has been notified and full payment has been received and cleared at our Bank, you will be given a date by which the organ is to be removed from our premises. Should the organ not be removed from our premises by this date, we reserve the right to charge whatever storage fee is necessary. Once an organ is paid for and cleared at our Bank, the customer is deemed responsible for insuring the instrument whether it is left at our premises or not. Any organ paid for is left with us at the customer's risk and we can take no responsibility for theft or damage while parked in our yard, it is the customer's responsibility to insure the mechanical organ and any ancillary equipment or vehicle, unless special arrangements have been made with us to provide insurance. All transactions have to be taken in our own currency (GB Pounds Sterling) so any prices shown in US Dollars $ and Euro € are for guidance only for USA and European residents using an estimated exchange rate. As the exchange rate alters daily, we can only work out an approximate cost. For up to date pricing in foreign currencies, please check with your bank on the current exchange rate.The prices shown do not include any import tax, duty or handling charges that may be liable upon delivery to a foreign country - please check with your local tax or customs office / couriers for likely import charges on the type of goods we sell. We are a registered company with the ICO. We are committed to protecting your privacy. We will only use the information that we collect about you lawfully. We are fully compliant with the current PCI Data Security Standards. Dean Organ Builders "The Music Box Shop " is obliged under these regulations to offer our household or private customers free take-back of their WEEE on a like-for-like basis when they buy a new Electrical or Electronic product from us. 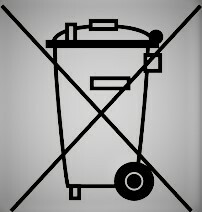 Goods are marked with the crossed-out wheeled bin symbol as shown at the bottom of this page, to indicate that they were produced after 13th August 2005, and should be disposed of separately from normal household waste so that they can be recycled. We reserve the right to alter/delete prices and specifications without prior notice or obligation. Please note that although we take as much care as possible to show pictures of the actual range of products available, because most of our products are handmade and wooden, the designs & colours may naturally vary slightly from those shown. The names and website titles, where applicable, are our company Trade Marks: E. L. Dean & Co, Dean Organs, Dean Organ Builders, The Music Box Shop, Pasquale & Co, Music Shop Direct, Shop 4 Music Boxes, Shop For Music Boxes, Music Boxes Direct, Gavioliphone.co.uk, Limonaire.co.uk, Gasparini.co.uk, The Bristol Showmen's Stores, Dean Group, Dean Group of Companies, Dean Music, Dean Music Group, Fairgroundorgan.co.uk, & Gavioli.co.uk. Please note we are the original Dean Organs company, not to be confused with other companies who trade in similar products with similar names or use website names that look like ours, we are not just web based but an established retail shop, run by a family that have continually traded from Whitchurch, Nr. Bristol since the 1930s.